The perfect roast chicken. There is nothing more classic. I've made more than a few in my days but I just keep coming back to this recipe from one of my Food Network faves Ina Garten. No one does classic like she does. I love her combination of vegetables in this one, particularly the fennel. It might be silly but this vegetable was literally on my bucket list of ingredients to use. I LOVE roasted vegetables and roasted fennel in this recipe turned out sweet with a hint of licorice and was delish. You can also toss in brussel sprouts or potatoes or parsnips if you want to change it up. 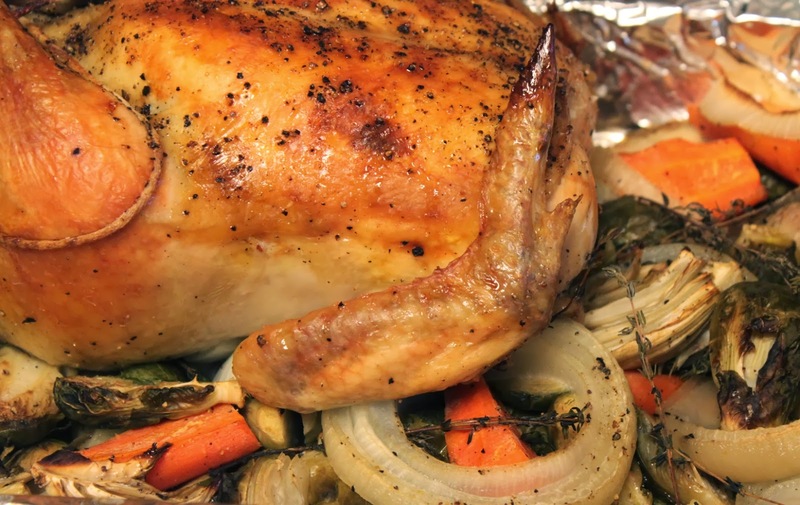 Prepare the vegetables and place in the bottom of a roasting pan covered in aluminum foil. (I love roasting but it can create a sticky mess so be sure to take a minute to cover the pan.) Toss with salt, pepper, 20 or so sprigs of thyme and olive oil. Spread around the pan to create a roasting rack for the chicken. Prepare the chicken by removing giblets and giving it a good rinse inside and out, removing excess fat or pinfeathers. Use a paper towel to pat the outside dry. Liberally salt and pepper the inside cavity. Stuff the cavity with a handful of thyme, half of the lemon and the split head of garlic. Close it off with the other half of the lemon. Rub the outside of the chicken with butter. (If you want to be neat about this, you can melt it and brush it like Ina but I like to give the chicken a good rub down.) Liberally salt and pepper the outside of the chicken with salt and pepper. Tie the legs together with kitchen string and tuck the wings under the body of the chicken. Place the chicken on top of the vegetables. Roast the chicken for about 90 minutes or until the juices run clear when you poke it between a leg and thigh or a meat thermometer reaches 160 degrees. My veggies all chopped up and ready for roasting. You can see I did toss in some brussel sprouts this round. The chicken all rubbed down and ready to be cooked. Done! with a little lemon poking out of the back. This can even been a great "prep ahead" meal. For my make ahead meal schedule, I've put this all together on Sunday night and covered the roasting pan with aluminium foil The night day I plan to serve it, I pop it in the oven before I head to work and set the delay start on my oven so that it's just about done when I get home with the girlies. I've also bought double the recipe and pre-prepped extra veggies and the cavity stuffing to put in the freezer for future cooking.